Catriona McKay is a diverse musician who pushes one of Scotland’s traditional instruments - the Scottish harp, to its limits. Through her composition and performing worldwide she is widely recognized for her unique style, inventiveness and daring rhythmic use of the Scottish harp. 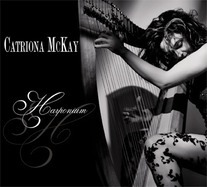 Catriona's new cd Harponium is music composed, recorded and produced by herself. Catriona has a duo with fiddler Chris Stout. They explore sounds that connect and challenge through a dynamic and adventurous dialogue of their native Scottish music. It is this special long standing musical partnership that forms an invaluable dimension to their creative output. Their highly acclaimed 2010 self-penned cd ‘White Nights’ was orchestrated by them for performances in 2011 with Nova Scotia Symphony. They have recently recorded Seaviagers concerto fro Scottish fiddle and harp, specially written for them to perform and record with the Scottish Ensemble by composer Sally Beamish. Catriona is a vital member of Fiddlers' Bid (Scots Trad Music Awards Album of the Year 2010) and a diverse musician whose other works include duos with Swedish nychelharper Olov Johansson and Strange Rainbow – a laptop & harp experimental music duo with Alistair MacDonald who features on her solo album Starfish, for which she won instrumentalist of the year at Scottish Trad Awards 2007. Her music, while based in Scottish Folk tradition, is yet contemporary and above all adventurous and exciting. Catriona McKay BAHons 1st class, PGDip, PPRNCM was awarded a Caird Trust scholarship and an Associated Board of the Royal Schools of Music scholarship to attend Royal Northern College of Music for postgraduate studies with Welsh harpist Eira Lynn Jones. She joined Yehudi Menuin’s Live Music Now! scheme in 1999, was a finalist for the BBC Radio 3 ‘Young Classical Musician’ 1999 and a NFMS (National Federation of Music Societies) Young Concert Artist for 2000/01. Catriona won the “Jakez Fran�ois International Celtic Harp Competition 2004” held in Nantes, France and represented Scotland with performances at at the World Harp Congress 2005 & 2011 and the European Harp Symposeum in 2007, 2009. Catriona was awarded the Scots Trad Music Awards ‘Instrumentalist of the Year 2007’. 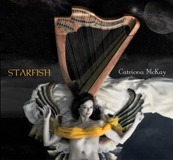 Catriona’s harp cd ‘STARFISH” was nominated as album of the year for the Scots Trad Music Awards 2008. Catriona was a finalist of the Glenfiddich ‘Spirit of Scotland’ music category awards 2010, recognizing and celebrating the achievements of Scottish individuals. Catriona is passionate about and dedicated to developing the Scottish harp. She has a close musical relationships with several musicians who help her on this path - including fiddle genius Chris Stout, nyckelharper maestro Olov Johansson, electroacoustic guru Alistair MacDonald and the mischevious band members of Fiddlers’ Bid. Solo projects include 3 solo cds,� a film score for Norwegian silent movie ‘Historien om en Gut’, Celtic Connections new voices commission FLOE as well as composing and arranging music for her various projects.